Windows 10's first big update just took place! Surely it gains a lot more users to update their PC to Windows 10 OS. For music enthusiats, this causes a strong demand for MP3 player as they ought to find the best MP3 music player that suits Windows 10 the most. Still sniffing around the best music player for Windows 10? No worries, here below is a detailed review of the best 3 free desktop MP3 player for Windows 10, read this top 3 free MP3 players review and to free download either of MP3 players to play music on your Windows 10 and Mac. 5KPlayer is the best free MP3 player on Windows 10/Mac which supports multichannel audio at both low bitrate and high bitrate, and this incredible Mac/Windows 10 music player is also capable of playing 4K resolution video songs on Windows 10 and Mac OS X with no hassle. Listening to music is probably the best way to entertainment yourself, no matter you want to work out or just relax. And right now the most commonly used music format is MP3, not only because it compressed the audio file to a comparatively smaller size, but also because MP3 is compatible with the most of music player devices. But if you want to bring out the best of a piece of MP3 music, a speaker box or earphones are far from enough, you need an excellent MP3 music player as well. ▼ Does this MP3 player comes with the features and functions you need? ▼Is this MP3 easy to use? The user interface is intuitive or not? ▼ Does this MP3 player support other music formats like AAC, FLAC, M4A, etc. other than MP3? ▼ Is this MP3 free of charge and 100% safe? ▼ Can this MP3 player manage your music files easily? The free MP3 players that are reviewed here including 5KPlayer, Windows Media Player and VLC Media Player. 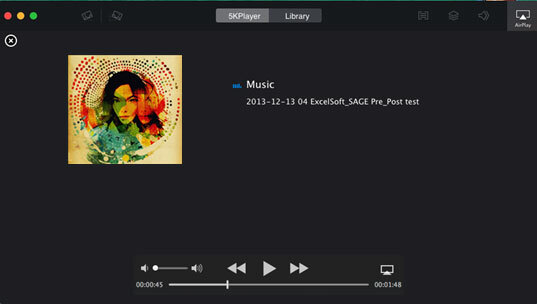 5KPlayer is the MP3 player for Windows 10 and Mac El Capitan that can not only play music in MP3, AAC, OGG, WMA, FLAC, etc. but also easily manage and organize music files on Windows 10 to your preference. It is a smart MP3 music player which creates music library, distinguishes music playlist, and favors songs by marking red heart. Better still, this MP3 music player for Windows and Mac has various playing modes such as single, order, circulation and random mode. What makes 5KPlayer the best Windows music player is that it provides limitless music resource by downloading free music MP3 FLAC MP4 from YouTube, Dailymotion, Soundcloud, and so on. -Plays 4K resolution video songs. -Unable to add lyrics subtitles during MP3 music playback on Windows 10/Mac. Is Windows Media Player the brand new Microsoft media player for window 10? Yes this MP3 player has the ability to rip music from discs, and synchronize music content with other mobile devices or portable MP3 player. Although Windows Media Player has not been updated specifically for Windows 10, this MP3 player does have some merits such as integrating web-browsing support to search online music store and then purchase to tune to internet radio stations. -Easy manage music files on Windows 10. VLC Player is the kind of MP3 player which has support for MP3, AAC, WMA and WAV audio files. In addition, this MP3 music player has a built-in Media Library just like 5KPlayer which can locate all the music files contained by a folder on your computer. And it has the ability to convert video format to MP3 audio, such as converting AVI to MP3. People tend to use VLC Player to play video more often as it can play 4K UHD videos but rarely use it to play MP3 music simply because sometimes VLC not working when playing MP3 music files files in VLC but produces no sound. -Safe and easy to use. -Open-sourced MP3 player, problem happens occasionally. How to Play MP3 Music with the Bes MP3 Player Software? After reviewing the MP3 players, we'll take 5KPlayer as an example to show you how to easily play MP3 music files on PC. Step 1. Download, install and launch 5KPlayer- the best free MP3 player for Mac El Captitan/Windows 10. Step 2. Select an MP3 file. You can load MP3 music simply by clicking "Music" on the main interface. This MP3 player can automatically locate the music folder spontaneously for you. Alternatively, you can add MP3 music for playback by right clicking the specific music file and then navigate to choose to open with 5KPlayer. When the music is been playing, you are free to choose to pause, fast forward the playback process and most amazingly, you can choose to AirPlay the music file to Apple TV or AirPlay speakers. 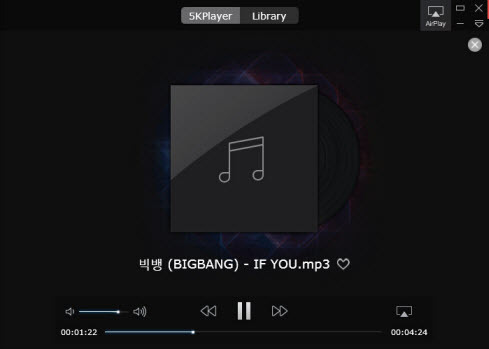 Note: In addition to play MP3 AAC FLAC music, 5KPlayer is also a powerful video music player featuring playing videos in any format, like freely playing 4K video, playing MKV video, flash video, AVI, WMV, and so on. Moreover, the built-in AirPlay feature can help stream MP3 music and MP4 MOV M4V video from iPhone/iPad/iPod to Mac/PC and from Mac/PC to Apple TV, AirPlay-enabled speakers, etc. What the most important is that this MP3 player can download limitless MP3 AAC music resource for playing. 5KPlayer is the top free YouTube music player, MP3 multimedia player to play MP3, Flac, M4A, OGG and WAV song files. Here, the most powerful free music player for Windows and Mac OS is ready for you to play all music songs in MP3, AAC, AC3, etc. Here introduces a few free MP3 MP4 player software that can play MP3, AAC, MP4, RMVB, H.264, H.265, WMV, MKV, AVI, etc.